Microsoft Access is a database management software that is used to quickly and easily manage and create databases. Access combines the relational Jet Database Engine with a highly user friendly graphical interface, allowing users to manipulate large amounts of data for analysis, reporting and reference. Access can import data from other applications like Excel (and many others) or link to data sources outside of the Access. While a large number of people today use Access in some capacity, and are familiar with its general usage, many of them just scratch the surface of knowing what this diverse program can do, and how it can help them do their jobs more efficiently. As a service to our customers, we are actively developing a library of free Access tutorials for you to use. We know that sometimes you may not need an entire course to learn what you need in Access, so we wanted to provide some good resources that can help you accomplish some common tasks in Access. 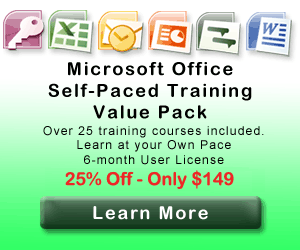 Getting a Certifcation in Access will demonstrate a proficiency in using Microsoft Access. These certifications can be beneficial to your career and can be obtained by getting the appropriate training and passing a certification exam from Microsoft. Below are the Microsoft Office Specialist (MOS) Certifications currently available for Microsoft Access.